THEN THE RAPTURE OF THE CHURCH HAS OCCURED. YOU HAVE BEEN LEFT BEHIND! THIS IS GOD'S GRACE AND MERCY BEING SHOWN TO YOU! The Events In This Video WILL Happen After The Rapture!!!! Dear Lord Jesus, I Know I Am A Sinner. I Believe You Died On The Cross. Because You Love Me So Much, You Paid The Penalty For My Sins, And You Came Into This World So That I Can Be Saved. Lord Jesus, Thank You For Your Sacrifice And I Ask You Now To Forgive My Sins. I Ask You To Come Into My Heart And Save My Soul. I Pledge My Life To You This Instant, For You Are My King And Savior. Thank You For Giving Me Eternal Life And A Home In Heaven. Thank You For Saving Me. In Your Name Jesus I Pray. Amen. HERE'S WHO THE REAL JESUS IS.... HE LOVES YOU! TIME IS SHORT...DO YOU KNOW JESUS?? This will be the headlines that you will see in most newspapers around the world. 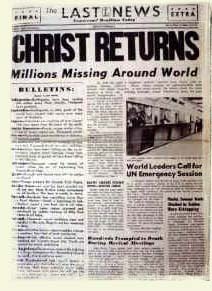 You may have already seen these headlines...or are about to see these headlines....because "The Rapture" of the believers in Jesus Christ has taken place or very soon is about to!!! 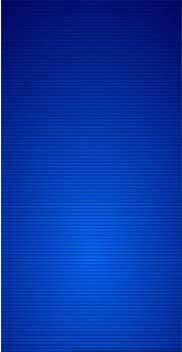 This web page is to tell you exactly what is involved in the sudden disappearance of people around the world. It is as simple as this: We who belong to Jesus Christ were called into the air above the planet in "The Rapture". Yes, that kookey, ridiculous, pie in the sky, fly away event that you've heard preachers or books talk about, and you thought as fantasy, will be or will happen at any moment, depending on when you read this, may have already happened. You Are Hearing or Will Soon Hear Many Reasons for the Disappearances. IT'S TIME!!! LEFT BEHIND LETTERS.. HE IS...... DROP THE MIC!